I told someone a few weeks ago that we could probably expect an increase in extremist attacks outside of the Middle East, and that, unfortunately, there would likely be attacks tied to refugees from Syria. Already, as I said it, there was the growing rumble of fear here in the U.S. regarding refugees, and my own concern was that if/when an attack happened that was connected with refugees, that it would feed such fear and even turn it into anger and hatred. Now we find that such an event has occurred in France. Jesus said, in talking about the things to come after his crucifixion, that “because of the evil of those days, the love of many will become cold”. We live in times where acts of evil will test our love, and the temptation of reacting to extremism with extremism will be great. However, the New Testament tells us to overcome evil with good. We cannot let these attacks drive us to greater fear, but we must decide that it will mean we will choose great love. If we allow events like those in Paris to result in closed hearts and doors to those fleeing the very evil we are facing, we will have allowed evil to win. If we allow the evil works of the relatively few cause us to judge whole people groups and their religion, we will have allowed evil to win. I know that we have to be wise in such times. We do not want to be naive. However, being wise does not preclude love. The question is how will we be wise in our love. For those who have pledged allegiance to the God who is love, our goal must be love, and wisdom should guide us in how to love better, not become a reason for how we can love less. In the Bible we are called to care for refugees. Jesus identifies himself with the strangers (foreigners) cared for by those he welcomes into the kingdom (Matt 25.34–40). Many of the heroes of scripture were refugees: Abraham and Sarah, Jacob, Joseph and all the sons of Jacob with their families, Moses, the children of Israel, David, Elijah.The early church became refugees fleeing persecution in Jerusalem and other regions. Jesus himself and his parents were refugees as they fled to Egypt to escape the violence of King Herod (Matthew 2.13–15). 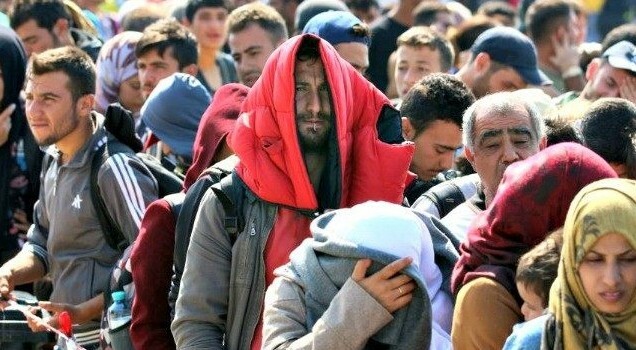 So it is not surprising that scripture tells both Israel and the early Christians to remember their identities as refugees and foreigners, and that this is a basis for both our actions as “foreigners here” and in how we treat those seeking shelter in our world (see Exodus 22.21, 23.9; Leviticus 19.34, 25.23; Deuteronomy 10.19, 23.7; Isaiah 16.3–5; Hebrews 11.13, 13.2). Fear is natural. We cannot help experiencing fear in times of trouble, threat, and uncertainty. But we do not have to be guided and led by fear. We can choose to be guided by love and the will of God. We can seek for our attitudes and actions to be shaped by the words and model of Jesus, rather than be shaped by the actions of evil.